The science behind earthquakes in the Himalaya. The seismographic record of the April 2015 Nepal earthquake measured at the Davis Hall Observatory in Northern Illinois University, Illinois. It took just ten seconds to move Kathmandu five feet to the south with its people, houses, temples, trucks and trees. Ten thousand square kilometres of Nepal’s mountains, rivers and agricultural land followed suit. The birds were the first to know of this great tectonic shift; they took to the air within seconds of the arrival of the earthquake waves. Then the weakest buildings began to crumble, tanks and pools sloshed water over their banks, and people lurched unsteadily. What the earthquake on 25 April 2015, and a months-long sequence of aftershocks, left behind is tragic and all too well known – a death toll exceeding 8500, an unimaginable disorder of damaged and destroyed buildings, over 3.5 million people homeless, and a 1000 severed tracks and paths in the mountains impeding the delivery of urgent relief supplies. Two decades ago, for a Himal issue in 1994, this writer described the potential effects of ‘the next great earthquake’ to hit Kathmandu. In many ways, the April earthquake fulfilled those predictions. But the bad news is that it was not the anticipated ‘big one’; a large future earthquake lurks in western Nepal. The good news, however, is that lessons learned from this earthquake could reduce both the economic consequences and loss of life in the next one. The mechanics of Himalayan earthquakes have fascinated physicists for decades. The fundamental reason behind these earthquakes is that it is the destiny of the Indian plate to descend beneath Tibet. India is just the surface expression of a vast, slowly overturning plastic chunk of the Earth’s mantle, driven by radioactive heat deep beneath the surface. We do not need to worry about the enormity of this subterranean process because it is ponderous and steady – India has been heading north for more than 170 million years. But for it to descend beneath Tibet, it must overcome the frictional resistance of the rocks at the base of the Himalaya. It does so every few hundred years in great earthquakes, where chunks of Himalaya hundreds of kilometers long, slip southward over India. The southern Himalaya acts like a battering ram moving with the Indian plate, gradually squeezing the rocks of northern Nepal that store elastic energy like a giant compression spring. Eventually, the energy stored in these compressed rocks will exceed the friction at the base of the Himalaya, driving central and southern Nepal southward. In the last 200 years, the Indian plate has moved toward Tibet by about four metres. This is roughly the distance the Himalaya slipped southward in the Nepal earthquake. Calculations show, however, that an earthquake like the one we have just witnessed should not have been possible. Friction should prevent such a heavy burden of rock from slipping southward over the Indian plate. The weight of the rocks being moved is enormous – 135,000 cubic kilometers of rock weighs, give or take a few mountains, about 360 trillion tonnes. The frictional force due to this weight effectively glues the Himalaya to the Indian plate. The glue is so strong that it is easier to pulverise the rocks in the north than to slide their colleagues in the south up and over the Indian plate. That is, we should expect to see the rocks of northern Himalaya bend, warp and crack, and we do indeed see some of this going on all the time – tiny earthquakes, many too small to feel, occur daily in this northern zone throughout the length of the Himalaya. Any of these forms of rock deformation are easier than inducing the Himalaya to slide southward. But since slide they do, we know that something extraordinary must happen to permit them to do so. That ‘something’ is well known to anyone who has tried to push a carpet across the floor of a room. The 25 April rupture started in the west and propagated eastward at the speed of sound, initiating as it did so the southward caterpillar-like motion of the Himalaya illustrated here. The Himalaya lifted sequentially (a few microns) and in less than 10 seconds had leaped incrementally an average of 3.5 m southward. Great earthquakes like that in east Nepal in 1934 (Mw=8.4) rupture a 100 km north-south distance, all the way to the Terai where they create an offset on the Main Frontal Thrust (MFT). From these buried offsets we have learned of historical and pre-historical earthquakes. The 2015 earthquake like those in 1833 and 1905 ran out of energy half way to the MFT. A region of stress now exists near the Kathmandu valley, and the Tibetan border is now closer to India. It is impossible to push a carpet because it tends to fold into crumples. One can pull it but for a large heavy carpet, the force required might tear its threads before it slides. An easier way to move a carpet is to pick up a corner and shake it violently forward. A ripple will travel across the carpet, moving it incrementally. If the ripple is powerful enough to reach the other end, the entire carpet will found to have been shifted in the direction of the ripple. The ripple lifts the carpet briefly above the floor, and when the carpet comes back to the ground, it does so slightly ahead of its previous position. 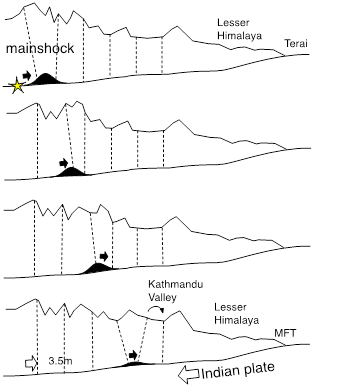 In the Himalaya, a ripple forms near the mainshock epicentre, and for a fraction of a second, the forces of the gigantic Himalayan spring can release all its stored elastic energy southward, without friction. Friction instantaneously goes to zero because, for this brief moment, the rocks at the base of the Himalaya and on the upper surface of the Indian plate are no longer in contact. This frictionless patch may be only a few hundreds of meters long, and its moment of freedom is short-lived. It immediately clamps shut in its new position, but it has already pushed an adjoining patch of rock into flight. This portion of rock, in turn slips a metre or more, just as a row of standing dominoes will fall in response to the collapse of its neighbour. However, unlike dominoes which sequentially fall under gravity at a comfortable walking speed, these tectonic slips are driven by immense forces in the rock, and the ripple progresses at three kilometres per second, more than 6700 miles per hour (roughly one-fourth the fly-by speed of Pluto’s New Horizons probe). Around noon on 25 April 2015, a patch on the upper surface of the Indian plate 15 kilometres beneath the village of Barpak in midwestern Nepal suddenly sprang loose and triggered a wave that propagated eastwards, fanning north and south as it did so, mining a 180-year-old reservoir of stored elastic energy. In some locations, the energy may have been building for twice this time, but we know of a similar large earthquake here in 1833 that was very probably the last time it broke loose. The ripple was just the facilitator, the zipper that opened the bag of energy from west to east. Once free to move, the Himalayan spring pushed northern Nepal southward, in some places by up to seven metres, in others by less than a metre but on average by about 3.5 metres. Nepal is now smaller than it was on 24 April because some of Nepal’s border with Tibet is now one metre closer to its border with India. This incremental shift is simply part of the long term approach of India’s border toward the Tibetan border which occurs at a rate of 1.8 metre every 100 years. For all the violence underground, the actual slip of northern Nepal was relatively gentle compared to recent major earthquakes elsewhere. Buildings felt their foundations move southward at maximum velocities of less than 50 centimetres per second, and accelerations preceding and following these maximum velocities were less than one-fourth of gravity. A horizontal acceleration of 0.25g (1g is 10 metres per second squared, the acceleration that together with your mass determines your weight) is equivalent to tilting a wall 15 degrees from the vertical, an angle that most concrete buildings can survive with impunity, but which few traditional stone and mud-cement buildings can tolerate. Thus, despite graphic news reporting of twisted concrete beams and destroyed buildings, damage to reinforced concrete structures accounted for less than 15 percent of the ruins. Moreover, destruction of many of the worst of these afflicted buildings can be attributed to shoddy assembly, weak materials, or unauthorised construction. The earthquake, however, wreaked havoc on 80 percent of Nepal’s traditional stone and masonry dwellings, and heritage temples built with similar techniques. The walls of many traditional stone houses in Nepal are formed by aligning two rows of angular or rounded rocks with their straight edges facing inside and outside, and with the intervening space filled with wet mud. The materials are dirt cheap, the assembly is fast, and the mud stops the draughts in winter. In an earthquake, however, the mud behaves little better than cheese, leaving the stones to move hither and thither. A short sharp shock is usually not a problem, but the long duration of a large earthquake moves these stones incrementally at first, and catastrophically once key blocks are dislodged. The shaking in the April earthquake and its aftershocks simply dismantled these weak walls, releasing in some cases a heavy burden of beams supporting stone roofs with disastrous consequences to anyone inside. Thirty thousand schoolrooms were destroyed, and half a million houses. Fortunately, the earthquake occurred at lunchtime on a Saturday. Schools were largely empty, and many dwellings were vacated. The resulting death-toll could have been ten times worse had the earthquake occurred the previous day or at night. But, why was the death toll not one hundred times smaller? Why not in single digits? Did no one see this coming? Seismologists indeed knew this earthquake was coming. The 1934 earthquake gave us a clear example of what an earthquake could do, and in 1979 seismologists started connecting the dots in the Himalaya. The logic was simple: once a slip had already occured in an area, it was not likely to experience another one again in the same place in the immediate future. The region east of Kathmandu had slipped in 1934 and was thus less likely to have an earthquake than the region to its west. Two decades later, as GPS methods began to indicate how fast the Himalaya was being squeezed, and the historical earthquake record became clearer, the problem area of Western Nepal was identified more precisely, and engineers began to take note. In the past decade, new information emerged suggesting that the last earthquake in the west had occurred in 1505, adding credence to the prediction that the next big earthquake there could have magnitude close to the 8.4-magnitude 1934 earthquake. In 2014, results from a study of the numerous trenches dug by geologists to gauge the effects of past earthquakes showed that there was a pattern – an earthquake in 1255 to the east of Kathmandu had been followed only 89 years later by an earthquake possibly to its west in 1344. Ergo, the 1934 earthquake to the east of Kathmandu might be followed 89 years later by an earthquake to its west in 2023. Although the numbers were appealing, the statistics were chronically weak; the notion was more of a hunch than a hypothesis. Yet, on 25 April, an earthquake occurred. Was the 2015 event that expected earthquake, occurring eight years earlier than predicted? Most seismologists think not, for three reasons: the earthquake was smaller than predicted, it didn’t rupture the foothill faults, and it occurred north of Kathmandu. Remarkably, this year’s damage to monasteries and villages in Tibet and in northern Nepal looks like a repeat of the damaging effects of a 7.7-magnitude earthquake that occurred in 1833. They were of almost the same size, and occurred in almost the same location. The 2015 earthquake, like the 1833 earthquake, failed to rupture south of Kathmandu. Attempts to find patterns in the dates of earthquakes that have historically damaged Kathmandu in the past millennium – 1000, 1255, 1344, 1408, 1681, 1767, 1833, 1866, 1934 and now 2015 – encounter problems because, except for the last few events, we don’t know how big they were or whether they occurred to the east or west (or north) of the city. We can be certain some earthquakes are missing from the list. For example, the largest known earthquake to the west of Kathmandu does not even appear on this list – an earthquake that occurred in 1505. At around 6 am on 6 June 1505, four monasteries in southern Tibet were destroyed over a distance of 600 kilometres by an earthquake that simultaneously damaged tall buildings in Agra, India. Trench excavations at the base of the Himalayan foothills affirm that an earthquake around the same time ruptured the surface in several places with more than 20 metres of slip. These two facts suggest that an earthquake with a magnitude possibly exceeding 8.6 ruptured the Himalaya from somewhere near Dehradun all the way to Pokhara. That it stopped short of reaching Kathmandu is suggested by its absence in Kathmandu’s historical record, and of course, one might further deduce that should such a large earthquake repeat, it will have no effect on Kathmandu. There is even some justification for this scientifically. In the same way that the 2015 earthquake was felt quite weakly in Mustang, a large earthquake west of Mustang might be felt quite weakly in Kathmandu. However, this would mean that the region between the eastern end of the 1505 rupture, and the western end of the 2015 rupture is associated with no known historical earthquake. It is certain that nothing has occurred since 1800, but less certain that nothing occurred in the previous 400 years. This information can be used to make a statement about the potential magnitudes of future earthquakes. The lowest magnitude we might expect here is close to the 2015 event, but the earthquake could be more than two or four times larger – a magnitude 8.0 or 8.2 earthquake – somewhat similar in scale to the 1934 earthquake in eastern Nepal. The 2015 earthquake is, of course, the earthquake that seismologists had been expecting. However, instead of a repeat of the 1505 earthquake, the 2015 earthquake did something altogether unexpected. It partly ruptured beneath Kathmandu, but something stopped it from barreling southward to the Himalayan foothills. The earthquake either ran out of energy, or a kink in the geometry of the Indian plate blocked its progress ten kilometres beneath the southern edge of the city. This has left an uncomfortable feeling that perhaps it is not all over yet. Our measurements show that the failure of the April 2015 earthquake to rupture all the way to the south has left a gentle bulge of highly stressed rock at the latitude of Kathmandu. The big question to be resolved is whether this bulge is going to stay, having raised the city 50 centimetres, and gently tilted the airport runway and the gradients of rivers (and sewers), or whether it is poised to do something more sinister. Will the stresses near Kathmandu eventually be released in an earthquake to the south, or will they gently diffuse away? The Gorkha earthquake ruptured a patch of the Himalaya measuring 150 km x 60 km which slipped on average 3.5 m (violet with white arrows indicating direction of slip). This is roughly equivalent to the amount Nepal has been squeezed by India’s convergence with Tibet since the last major earthquake north of Kathmandu (in 1833). The rupture zone of the 1934 earthquake slipped about 12 m equivalent to the amount accumulated by convergence since an earthquake east of Kathmandu in 1255. The rupture zone of the 1505 earthquake is not known with any certainty but it is believed to have slipped more than 20 m. The regions indicated by large question marks will eventually slip, but we do not know when. Stars indicate epicenters of mainshocks in 1934 and 2015. Key GPS measurements are afoot to answer these questions, but in the absence of immediate answers, we may invoke historical evidence to conjecture whether a damaging future earthquake is at all likely south of the city. The resemblance of this earthquake to one from 1833 permits us a potential insight into the next few decades. Two large delayed aftershocks followed the 1833 earthquake – one in 1835 and another in 1866. They were both big enough to cause damage but were much smaller than the 1833 mainshock. Our best estimate is that these earthquakes did not exceed magnitude 6.5, and although we suspect they occurred to the north of Kathmandu, they could equally have occurred to the south. Arguing against an earthquake to the south substantially reducing Kathmandu’s bulge of stress, we must weigh the fact that the 1833 rupture also stopped short of making it completely to the south. Thus two successive earthquakes have similarly failed to rupture beneath the Lesser Himalaya. Setting aside the argument that maybe a slip occurred and we did not recognise it, we know of one other rupture that likewise failed to reach the Himalayan foothills, that is associated with the 7.8-magnitude earthquake west of Dehradun in 1905. We have the results of the venerable Trigonometrical Survey of India to tell us that the 1905 rupture never made it to the Ganga Plain. So why all the fuss about such details? The problem is that these incomplete ruptures all constitute failures amidst a backdrop of complete successes. For the Indian plate to continue heading north, all the unruptured portions of the southern Himalaya must also rupture. We know that they indeed do so because geologists have now exhumed dozens of historical ruptures in trenches at the base of the Himalayan foothills, the most recent in 1934, with slip in individual events ranging from three to 23 metres. So the southern part of the Himalaya definitely slips now and then, and it does so in infrequent, very large earthquakes. A recent example from India is that prior to the great 2004 Indian Ocean tsunami, the only earthquakes we knew about in the Andaman and Nicobar Islands were those with magnitudes less than 7.9, in 1881 and 1941. The 2004 earthquake ruptured 1600 kilometres of India’s boundary all the way from Indonesia to Burma, and made a clean sweep of all the previous smaller rupture zones. The inferred 600-kilometres-long 1505 Himalayan earthquake may have been one of these “clean sweep” ruptures. A very large earthquake will eventually occur in the Himalaya that will cause the currently unruptured region south of Kathmandu to catch up. Could this very large earthquake occur soon? Again, sifting through such historical threads available to us, we have only one example in the Himalaya of a large earthquake preceding a much larger contiguous earthquake. In 1947, a 7.5-magnitude earthquake ruptured a region of Arunachal Pradesh just three years before the great 8.6-magnitude Assam earthquake. Although the seismic history offers a bewildering view of Nepal’s seismic future, the details are mere footnotes to what can and surely must be done before the next earthquake. Thus, although most seismologists will debate the available historical threads and tectonic facts for hours, they will all agree on one issue, that earthquakes will continue to shake Nepal in the future. They also agree that something is brewing in western Nepal. What they cannot agree on is when and how big the next earthquake will be. Mistakenly, this question is the only one that most people consider worth asking. Let’s stand back a moment and ask what important lessons we have learned from the recent earthquake. The first obvious lesson is that it is now time to abandon mud as a substitute for Portland cement for constructing dwellings in Nepal. Certain simple features of earthquake resistance must also be incorporated if these masonry piles are to withstand future earthquakes. Such elementary features as ring-beams and wire meshes to hold the inside and outside of dwellings together may cost several thousands of rupees, but their omission must be considered suicide for their present owners. The second lesson from the 25 April earthquake that has astonished some engineers is the relatively benign accelerations that accompanied the mainshock. The aftershock on 12 May, measuring 7.3 magnitude, was smaller but in fact more violent. Most engineers will describe their reinforced concrete creations as having ‘performed well’ in both earthquakes. This is to their credit, but it is also due to the unexpectedly low accelerations that characterised shaking. Were the accelerations in the 25 April mainshock typical of past Himalayan earthquakes, or were there freak circumstances that kept them low? Unfortunately, however, this is the first Himalayan earthquake we have monitored with seismometers directly above the rupture, making this question unanswerable. Some of the seismic data that might answer this question remain secret at present. No doubt the data will eventually be made available, but at one meeting in Kathmandu after the earthquake, seismologists and engineers were astonished to find the data being accompanied by a prominent copyright symbol. Of concern to all is the possibility that the low accelerations in April may seed complacency in the perceived need for earthquake resistant construction. Relaxed standards, or any relaxation in building inspections, would be fatal if the low accelerations in the April earthquake were not typical of previous or future great Himalayan earthquakes. Accelerations exceeding 1 g occurred in the 1897 Shillong earthquake, but that is known to be a very different mechanism from the April event. Accelerations in the 1905 (magnitude 7.8) Kangra earthquake, and the 1934 (magnitude 8.4) Nepal earthquake, assessed from building damage, appear to have been more than twice that in the Gorkha earthquake, but few would contest the ambiguity associated with these non-instrumental assessments of ground motion. The low accelerations in the earthquake have important implications for large scale engineering structures planned or already operating in the Himalaya. Numerous plans for hydroelectric dams are being discussed both in Nepal and the Indian Himalaya. Some existing dams have been criticised for neglecting the possibly excessive accelerations from great Himalayan earthquakes. For example the 260 metres high earth-filled Tehri Dam was designed decades before its actual construction to withstand accelerations of 0.25g imposed for 15 seconds, a value that was considered unacceptably low by many seismologists who argued for accelerations exceeding 0.56g for 30 seconds. That accelerations did not exceed 0.25g in the Gorkha earthquake will no doubt reassure those in the Indian government who gave the dam the go-ahead despite its perceived design inadequacies. However, although the accelerations were low, the displacements, velocities and the duration of shaking in the Gorkha earthquake were much larger than considered in the initial design of the Tehri dam, and the Gorkha earthquake released one-sixteenth of the energy considered by dam designers. Computer simulations of the Tehri dam and other planned hydropower schemes using the seismograms from the Gorkha earthquake as input will provide a much needed element of reality to Himalayan dam safety assessments. In the absence of a previously recorded major earthquake in the Himalaya, previous simulations have used seismograms from very different tectonic settings. Seismologists have an ethical dilemma: should they publicly announce the very real possibility of an earthquake in the next few years, or should they maintain silence in the interests of not spreading alarm. In the case of a future earthquake in western Nepal, the only uncertainty is concerning its date. For some scientists, the ignorance of when this earthquake will occur is sufficient for them to remain silent. I happen to disagree with this notion for very practical reasons. About two months after the April 2015 earthquakes, among the ruins of a village in Nepal, I saw people reconstructing their homes in exactly the same way as they existed before. They argued that no future earthquake was now expected for hundreds of years, if ever. No one had told them that the large earthquakes will recur, presumably because of the fear of spreading alarm to an already distressed public. However, there should be no secret about risks of future earthquakes, just as there is no secret about forecasts of tomorrow’s weather. People realise the need to avoid fragile construction, but insulating them from the knowledge of the inevitability of future earthquakes will only encourage cutting costs to avoid the expenses of constructing earthquake-resistant structures. There is a real challenge, however, when it comes to disseminating accurate knowledge. Good faith discussions among scientists and their qualified conclusions, can take a totally different form when delivered out of context in banner headlines. The extraordinary difficulty now faced by seismologists concerns convincing the authorities in Nepal that the enormity of the task of rebuilding the region recently damaged, is merely a prelude to the much larger problem of rebuilding, or earthquake retrofitting, the rest of Nepal. It would be irresponsible for seismologists to remain silent about this, and perhaps their role will be merely to support common sense conclusions already evident to the planners of tomorrow’s Nepal. But to some politicians or civil servants the knowledge that the recent earthquake is the tip of an iceberg will come as a bitter pill. For every destroyed house in the epicentral region, there must be four or five in the houses in the villages of western Nepal that can be considered scheduled for certain destruction by the next earthquake. The vulnerability of these dwellings can be ignored if no earthquake is expected, and they will remain vulnerable if the seismologists of Nepal fail to close the loop between esoteric knowledge and those responsible for action. The mechanism for delivering this unwelcome news is far from clear, since seismologists are not noted for their ability to communicate complex uncertainties into black and white future realities. In this case the unwelcome news is tantamount to a statement that the dwellings of an entire nation should be re-engineered. This is surely the responsibility of government, for if not the political leadership, who should take responsibility for saving the lives of its citizens from future disaster? Nepal’s structural engineers in the past two decades have succeeded in earthquake-proofing a few hundred schools, and training many dozens of contractors and builders in the art and science of earthquake resistance. Also in the past few decades, new structures were assembled by Nepal’s architects and engineers with earthquake shaking in mind, sometimes exceeding local minimum design recommendations. All this was undertaken without ever experiencing the devastations of a powerful earthquake. It remains to be seen whether the lessons of the April earthquake will now be extended beyond the recent disaster to the area of the next great earthquake. ~ Roger Bilham is Professor of Geology at University of Colorado, Boulder. ~ This article was first published in July 2015. Thanks once again for a great reading. Dhaka and Bangladesh are evolving on dramatically different courses. Workers in Bangladesh’s garment industry see no relief despite wage increases. One historian’s move away from history, and back into the real world. A reporter recollects the untold stories of the 1999 Kargil War.